The La Mesa Village is known for its events that close the boulevard to car traffic and get the public strolling around, such as Oktoberfest and the Flag Day Parade. And now the Village can add one more event to the list — weekly farmers markets. On March 27, City Council voted to approve a request by La Mesa Village Association (LMVA) to move the Friday farmers market from its current home of the Civic Center parking lot to La Mesa Boulevard between Palm Avenue and Fourth Street, starting on Friday, May 4. In addition to moving the farmers market location, the time of the market will change from 2–6 p.m. to 3–7 p.m. La Mesa Boulevard will be closed to car traffic 1–8 p.m. to allow vendors to set up and break down their booths. The size of the market is also changing, doubling from its current 25 vendors to 50 to 55 vendors. Farmers and packaged food vendors will be placed between Third and Fourth streets, and additional packaged food vendors and arts and crafts vendors, as well as hot food vendors will be placed between Palm Avenue and Third Street. No alcohol will be sold or allowed in event area. The City of La Mesa — who has sponsored the Friday farmers market since 1993 — will be turning the responsibility of operating the market to LMVA, who has hired Brian Beevers of Brian’s Farmers Markets as market manager. LMVA is also responsible for paying the city $9,000 annually to cover costs of lost parking meter revenue and police a fire services. At the City Council meeting, Janet Castanos spoke in favor of moving the farmers market from its current “anemic” location, which she described as uncomfortable and dangerous for children due to its proximity to traffic. 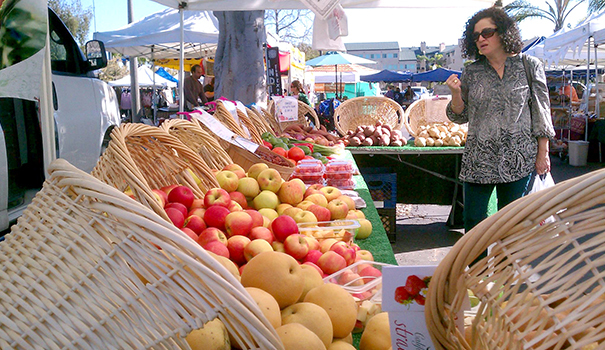 “I prefer to go to other farmers markets because they are more interesting than La Mesa and I’ve lived in La Mesa for 36 years, so I would really like to be [in the Village] at our own farmers market,” she said. Theresa Favro, owner of the Amethyst Moon, said the move will be good for her business and good for her customers. Deanne Ross who operates the Act II Clothing Store conducted an informal survey with her customers and reported that 82 out of 90 surveyed supported moving the market. “I am uber, uber, uber, mega, mega, mega in support of the farmers market in the Village,” said local real estate professional and Village resident Laura Lothian, who added that demand for La Mesa real estate is “through the roof” in part due to activities and events in the Village. However, not every business in the Village was in support of the move. John Bedlion, who owns Johnny B’s Burgers, Brews & Spirits in the Village, said while he does support having a farmers market in the Village, he does not support it being held on Friday. He suggested that the market be moved to Tuesday or Wednesday when the Village merchants have less business than they do on Fridays. Bedlion said he also represented other Village establishments that oppose a Friday market in the Village, including Pete’s Place, The Regal Bar and BO-beau kitchen & garden due to the impacts it will have on existing customers with regards to parking. Lupe Marrujo, proprietor of Por Favor Mexican restaurant & Cantina, said she is worried that the market will scare off her customers on Friday night, which is one of her busiest days. LMVA president Aaron Dean said he understands the concerns of businesses of worried about parking, but believes the farmers market will ultimately be a success for everyone in the Village. Dean said the LMVA also wanted to move the market to Tuesday because more than any other day of the week, they felt that Tuesday was a day in the Village that businesses could use more people. “The biggest problem we had with Tuesday was the farmers themselves had been burned at different other markets that haven’t worked on Tuesdays or Wednesdays because the people don’t come out,” he said and added that other farmers market managers told him they were “terrified” to commit to a Tuesday or Wednesday. LMVA also looked at Thursdays, but were not were not possible because the market would conflict with the car show events in the summer. Weekends would have been hard to get vendors who are already booked at much larger markets and Mondays are a day off for farmers, he said. 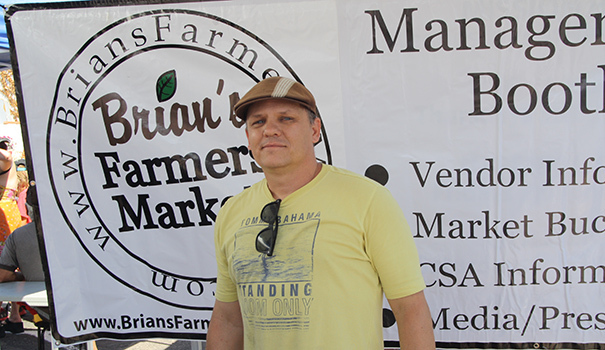 Vincent Perez, an assistant to Beevers at Brian’s Farmers Markets, also warned that moving the day of the market could spell the end of a farmers market in La Mesa completely. “One of the most detrimental things you can do to a market is move the day,” he said. “That’s one of the things that if you do it, the market can just die out completely and then you lose it.” The reason, Perez said, is that the vendors have their whole week set up and already have a market every other day. Dean said that if the market didn’t work out for the businesses in the Village after a few months of trying it out, the city could always move it back to the Civic Center parking lot, or even back to its original location in the Allison Street parking lot. “But if we move the market to another day, we lose that ability all together. We’d lose the market completely,” he said. Before voting, the City Council weighed in on the move. Vice Mayor Kristine Alessio agreed that the current location is “terrible,” but was too concerned about the impact on businesses on Fridays and ended up casting the lone vote against the move. “It needs to be in the Village but I am just not there where you have six of the long-term businesses saying this is going to hurt me. I cannot support it being on Friday,” she said. Mayor Mark Arapostathis said that feedback he’d received about the current market was that “there’s no there there,” and agreed it needed to move and added that because the city plans to redevelop the Civic Center, that the market will need to move either way. Arapostathis said the council needed to be good stewards of businesses and provide some assurance that concerns are being heard and suggested that the city monitor the market as it goes forward as it goes forward and make any necessary changes and suggested the council grant the event permit for less than a year. Councilmember Colin Parent agreed that running a trial period is a good idea for the market, but that with his experience working on shutting down streets for events and promoting walking in cities for Circulate San Diego, he predicts the market will be a success.